(if that is what you are thinking), but here are some tips below. 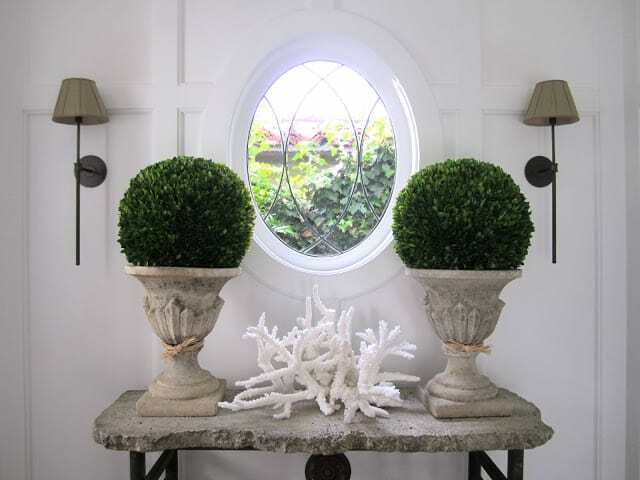 These beautifully preserved boxwood spheres in Debbie’s entry are from Restoration Hardware. They aren’t cheap but they are on sale right now. 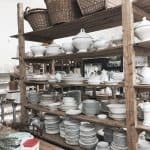 Don’t buy the plastic kind at Pottery Barn. Here they are in the topiary version that would be lovely on a mantel or in a kitchen window. Even Target has cute preserved boxwoods by Smith and Hawkins. In my gym, every time I walk past the dusty ficus trees (where you can see the plastic branch to leaf attachments), I just have to shake my head. The place would be better off without them. 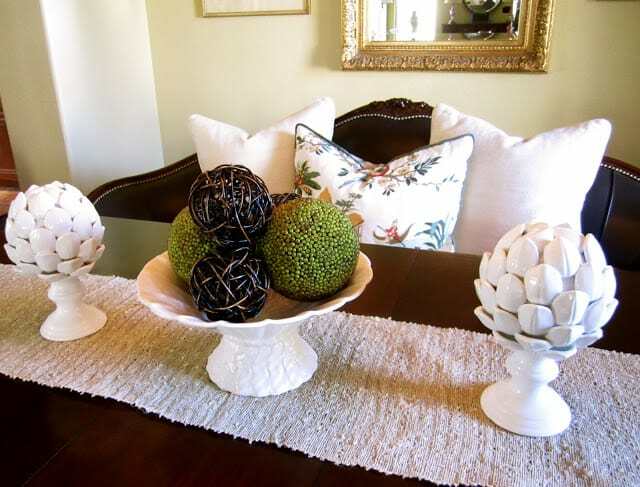 How about using these organic looking spheres for some greenery, like my sister does on her dining room table? Or orchids last a long time. Just place a couple of ice cubes on top once a week. These are either from Home Depot or Trader Joe’s. I added the moss. Claire uses succulents on her kitchen island…these are tough to kill. With saucers and felt pads, these would be charming inside and require little attention. If you aren’t around enough to water your house plant, use a Jardinier reservoir system. I filled the pot with some pebbles, potting soil, ivy and moss. 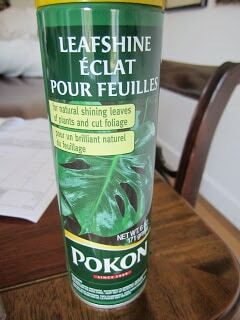 Leaf shine adds a florist touch. Voila…only needs watering every week to 10 days. I put a cork mat under the basket to protect the floor. 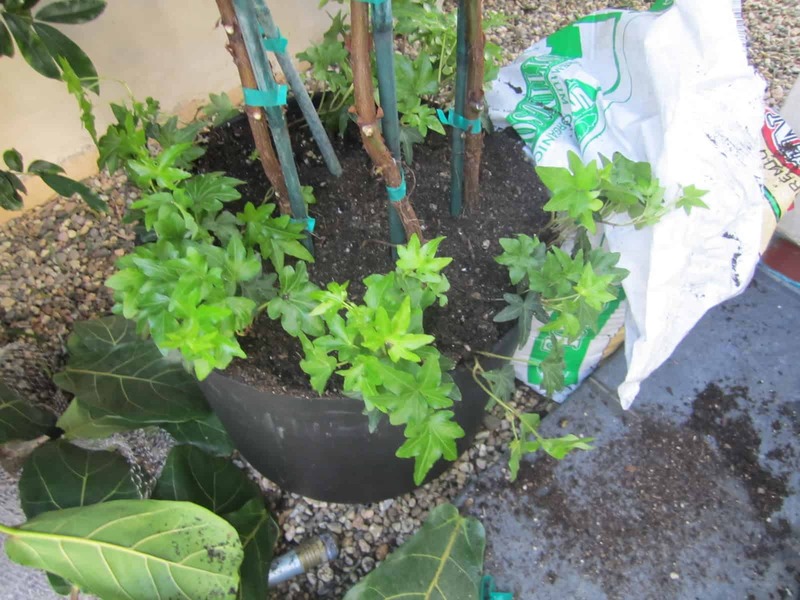 Donna uses the Jardinier system and has kept her tree alive for a couple of years (or is it even longer, Donna?). She also feeds it fertilizer down the tube. Note to self: buy liquid plant fertilizer. I am not a totally against fake plants. Look what I have in my laundry room–from Pottery Barn a few years ago. Ha! All the watering these get is to rinse the dust off. So what do you think? Live, preserved, artificial or none at all? Love Debbie's entry way. I prefer live or preserved…but do admit that I have some faux floral dogwood from pottery barn. I usually go with cut flowers and also orchids which do last a long time. 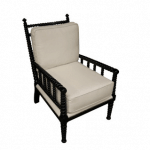 I love the preserved boxwood from Restoration Hardware. I am going to go check that out! Thanks for the information. I have only live plants in my home, but, I do have a few silk flowers. They're pretty realistic looking, though. I agree, Mary Ann, that there's nothing appealing about a dust covered plant, whether it's real or artificial. Great post, with some excellent low maintenance plant suggestions. Have a lovely Saturday, Mary Ann! What I think is I love everything I see in this post! I do have a few silk orchids I will confess but they are exceptional and everyone goes up to touch them because they dont' believe me! If I found really good boxwoods or spheres I would buy them but they would have to be really good, otherwise I much prefer the real live version:)Never had fake greenery and am not opposed to it as long as its done really well. I'm s plant purest–it has to be real or forget about it. just like nate berkus says. love all your images, by the way. makes me want to go out and get more greenery. love what you've laid out for us. I prefer live. However, I have preserved boxwood topiaries from Ballard Design which is love….They are a little pricey, however, they were worth it! 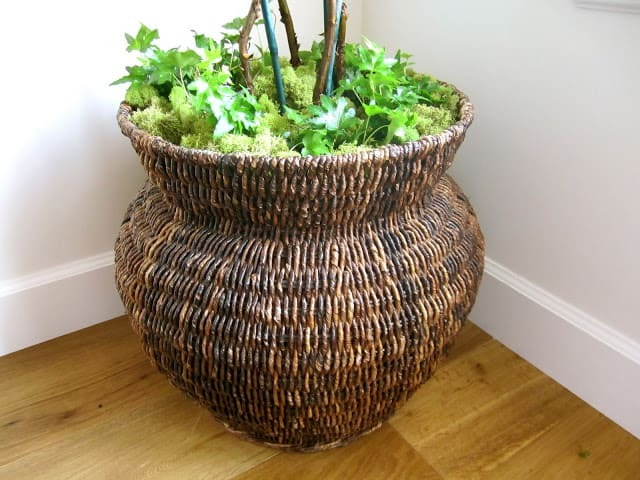 I would love to do preserved boxwood at the lakehouse. We are so absent during the winter, I usually lose one or two plants. I don't like artificial at all. Like your sister does, there are other ways to being in green! Live! I totally agree. I've done a post on this myself. I have one dried boxwood topiary and need to get more. I love your huge tree. BTW, never heard of that watering system. I will check that out. I agree! 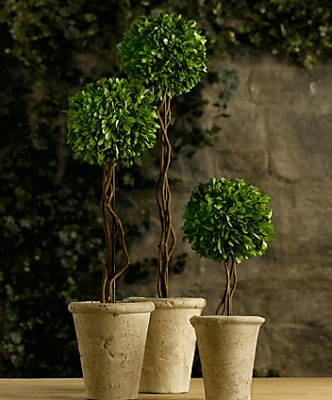 No fake plants…..love the boxwood topiaries. I have 2 fig trees that are doing pretty good. They actually need very little care. I agree with you. If it is fake, it better look real and be able to withstand a shower. Nothing worse than seeing a real or artificial plant full of dust. Just put them in the bath tub and spray away with barely warm water. This system here is perfect. I will have to order this. Have a great evening, and thank you for the nice tips. I love your ideas! I love real plants too, even though there are so amazing fakes now. I do love the preserved boxwoods! I agree, go real! Love the preserved boxwoods! If you have a good source, you can find amazing silks that will fool anyone. We've often sourced gorgeous silks for our clients, but they are very expensive. Real plants are wonderful, but for some, they are a burden. If silks make you happy, I believe you should have silks. If real plants are what you love, have real plants. There are no rules. Have what works for you and makes you happy. Funny that you should post about this, Mary Ann….my husband and I had a discussion yesterday about our fake Christmas wreath and garland. I hate them, but he loves that the lights are already on them and we both love how they look twinkling at night when you can't see how fake they are (they are still not going up this year!) I'm not a big fan of fake in the house but your little laundry room numbers are mighty cute – I could do those!! 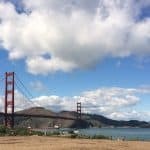 Thanks for this post – great topic. I agree live or preserved are the only way to go. Great post. Only real for me, but then again I live in SW Florida. Easy for me to say. I dislike most fake plants too but a year ago the fiddle leaf fig tree I bought began withering and I guess it wasn't getting enough light. It finally died. So I bought an expensive fake fiddle leaf fig tree at a place called Shindoa Design [I'm in San Diego ] and I love it. 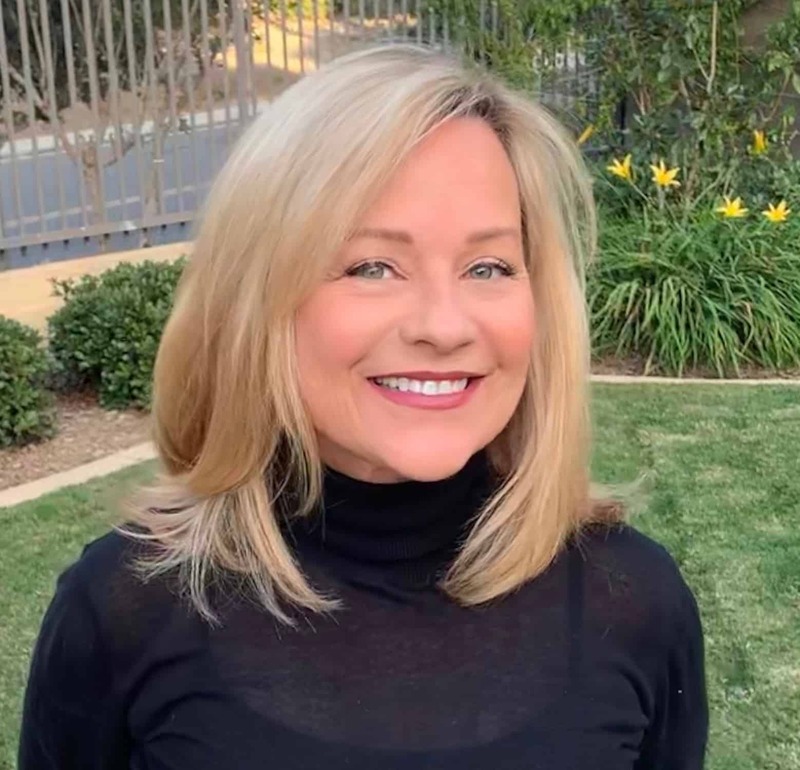 Your blog is wonderful – I've been reading for awhile now and learning so much. And your fiddle leaf fig tree looks great! such great info Mary Ann, I've never seen that watering system before. I have an alarm on my iphone that reminds me else they would all by dead! M.
Great thoughts! Yes, I agree, most silk plants and flowers should be banished! Some are truly lifelike, but they need to be kept spotless, when going that route. 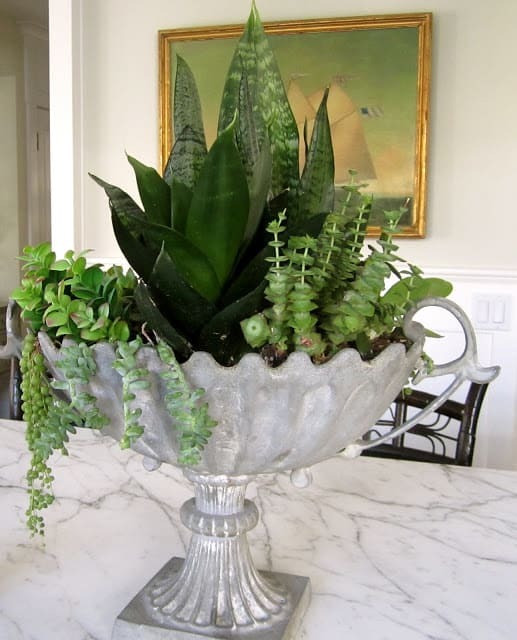 I love the beautiful urn with the succulents! Gorgeous! 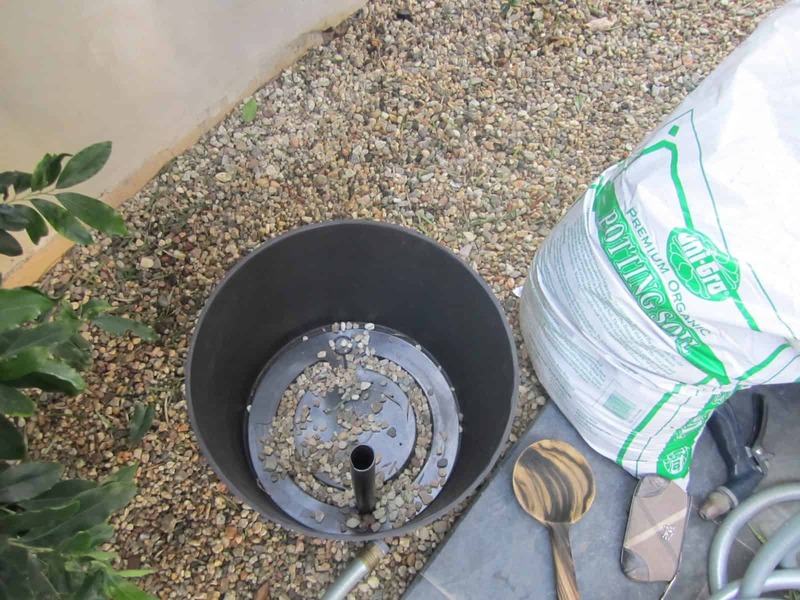 I forgot to mention that with the Jardinier system…there is a dipstick that measures the water in the bottom so you know when and how much water to add. I confess; I have silk ivy in a container at the top of a bookshelf. It looks so pretty and I could never keep real alive up there. So many great ideas here! Love the tip about the ice cubes to water orchids. Also adore succulents! I think it depends on how disciplined you are to have live plants, faux plants or no plants at all. There is care involved with both live and faux. There is nothing better to pull a room together than plants. Great options and advice on this post that everyone should consider and enjoy a bit of green whatever you decde. and it is certain you have a green thumb. I have to agree that fake flowers are tacky and i would never put them in a client's house, but I will admit I have used them in my own from time to time! A wonderful post – I couldn't agree more! Anything fake (plants, fruit, etc) seem to make a home a little less authentic. Only real plants for me! I have to say, the ones in your laundry room from PB look so real. Could have fooled me! I'm a big fan of the orchids at Home Depot. They are about the price of a bouquet of flowers, but last much much longer! I like your idea to enhance them by putting them in a pretty pot and adding moss. very nice post, with great advice. I don't have any real plants indoors anymore, unless I'm starting something for the garden. 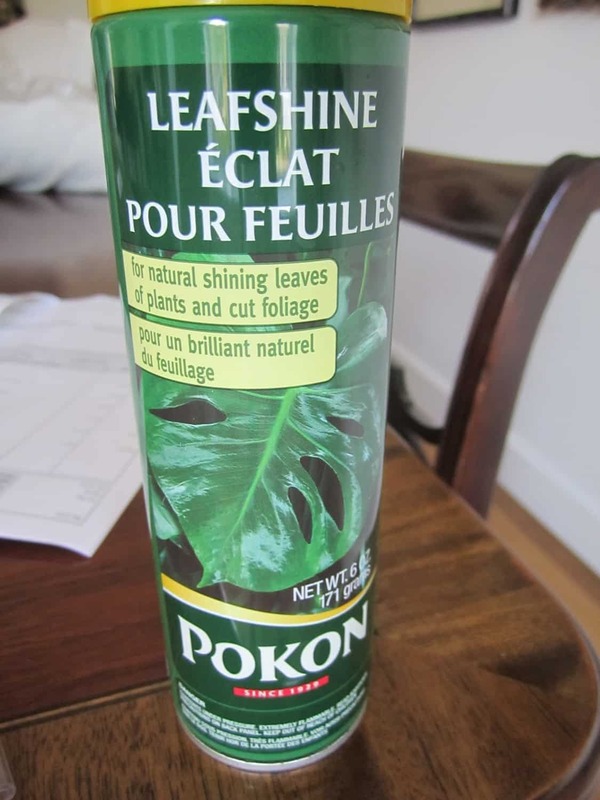 I do remember learning years ago that rubbing mayo on the big shiny leaf plants to clean them (just a dab with a cloth or paper towel) worked well. It didn't hurt them, they looked beautiful again, and didn't get dusty for a long time. Well I do like my fake wood fruit. And the Christmas greenery is all fake. I still find needles from my last real wreath. 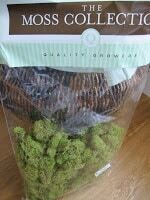 I buy the good stuff but any plant has to be real. Except the fake fern that I use on a top shelf. Most plants die but one or two live on. I may try the succulents. After Christmas I will get an orchid for the coffee table. I'm so glad you did this post! Real all the way. Cheers. Great post – real not fake!!! 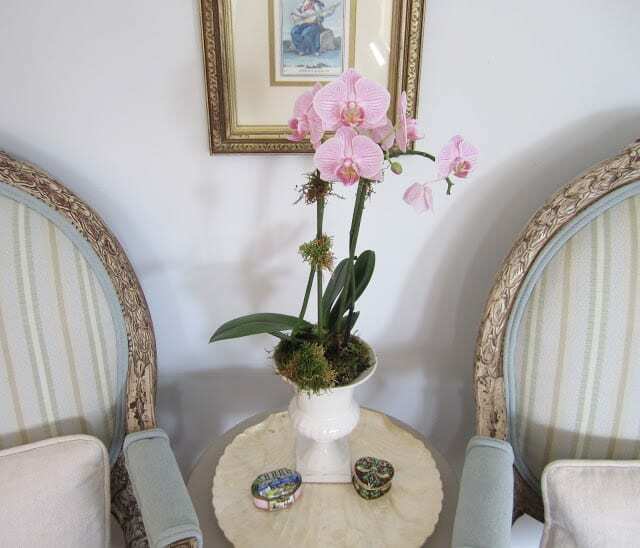 However I have to say that a lot of my clients LOVE fake plants and I have been known to indulge them. My rule is that it has to at least look authentic and possible (in season and the best fake you can get). For me, I'd rather have a bunch of lemon leaves (super cheap at the florist and they last for a very long time) then a fake plant. 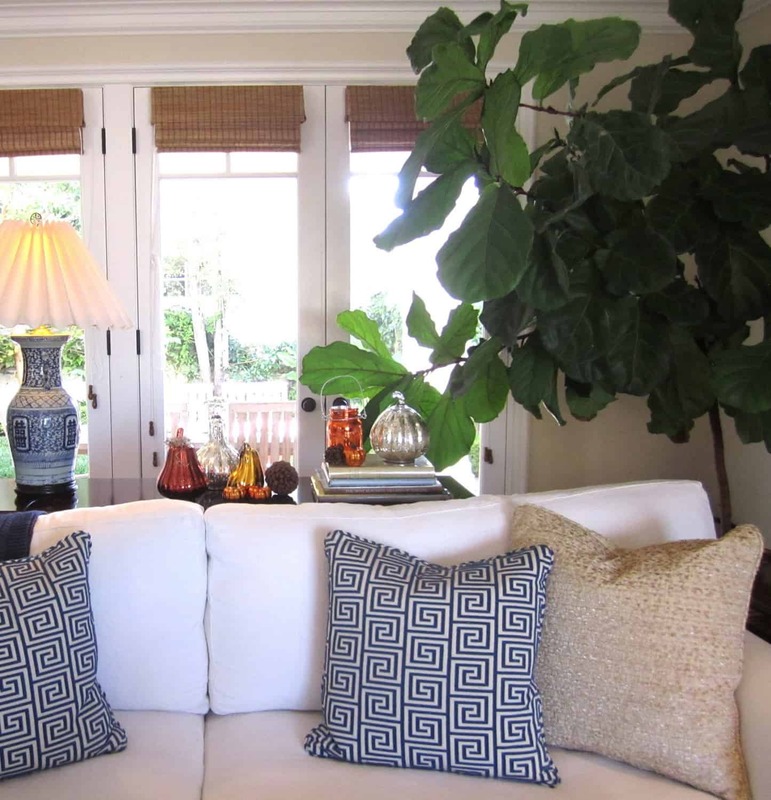 Mary Ann, just saw your home featured on the Circa Lighting blog! Congratulations! 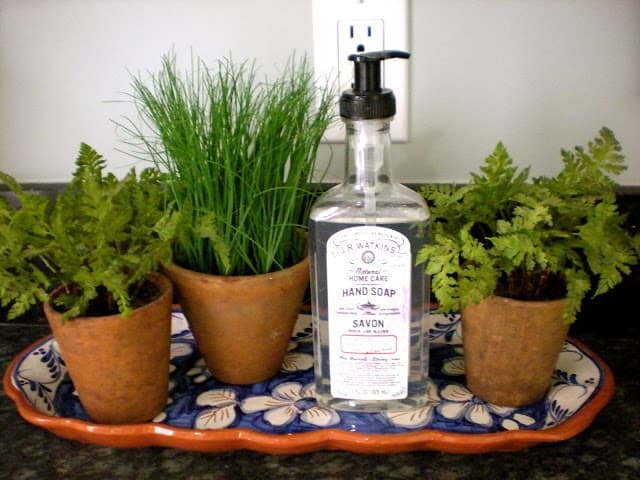 Great post, I love real plants, but I do not have a green thumb! I will have to try this watering system. Thanks Maryann. 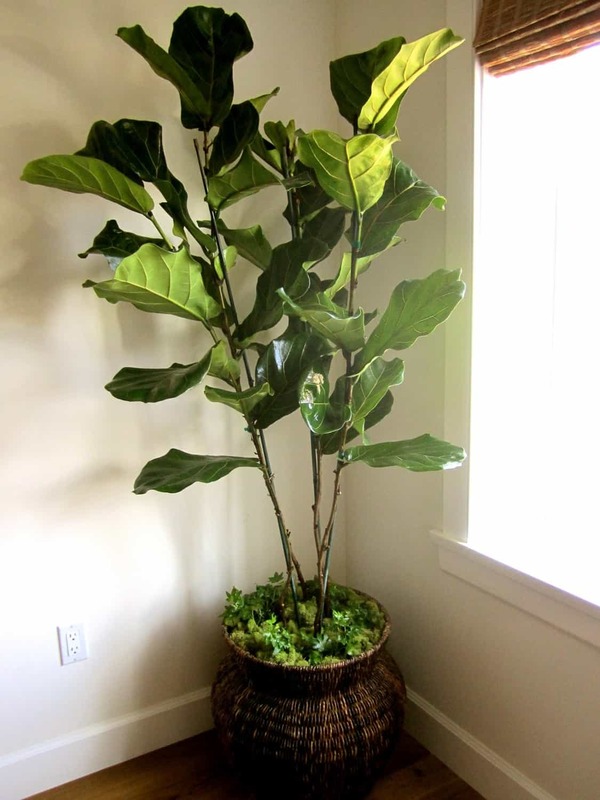 I love real plants but the "care" gets to me….So, your artificial options are great ideas…Great post! I'm all for real, live plants! So much better than fake any day in my book! Well, since we have ties to a landscape company, I have to say 'go natural' but I love the preserved boxwood. What a great post! Live only! 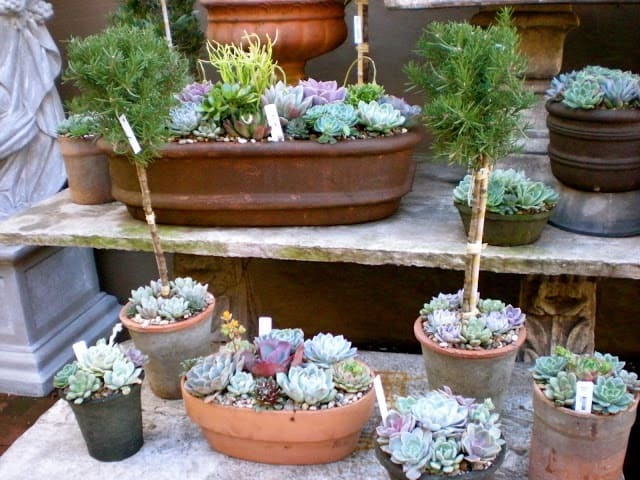 Small plants are affordable and last for years. I try to water my plants every Saturday so I don't forget. A weekly watering is really all it takes, I don't even fertilize like they always recommend. My husband has a big hangup over fake or plastic plants so we have never owned one. I would not be opposed to buying one if its a really good one, but do prefer real. I'm so with you on this Mary Ann! But I do love your little tray in the laundry room…that I could go for. i just saw your dining room on the Circa Lighting blog too! Live only. But then maybe that's because there are places where I can buy real for very few $$$. I truly think they are so superior. 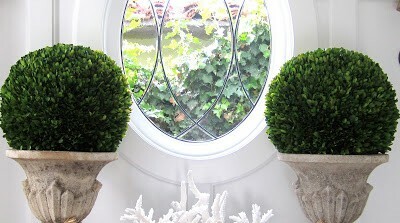 I love the preserved boxwood and think they are worth the money since you don't have to replace them. I'll have to check out the sale at Restoration Hardware. By the way, where did you get your beautiful fig tree? I have always wanted one of those. Great tips and ideas. And I love the preserved boxwoods. There's no reason these days why you can't have the real deal inside! May I invite you and your friends to a customized pillow giveaway I'm hosting? Very cool item. Happy holidays. Excellent advice! I love succulents and herbs for greenergy. 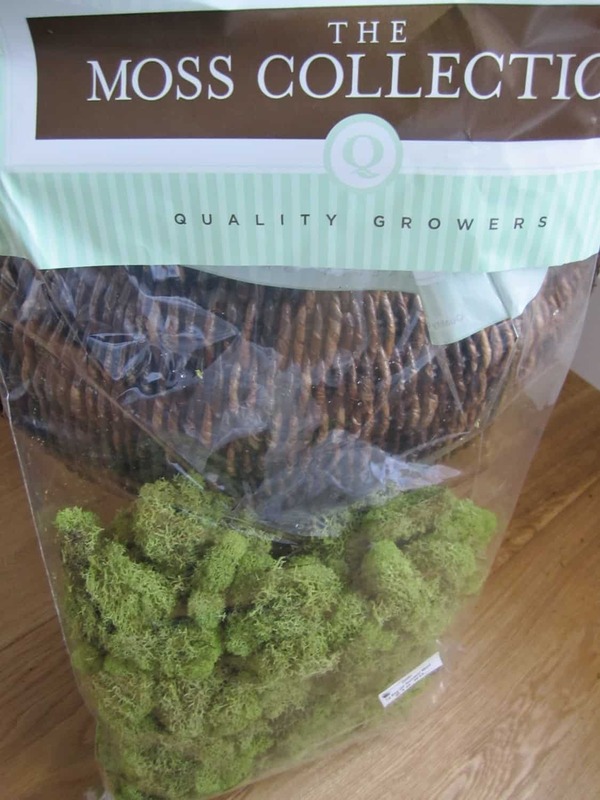 I had no idea, though, that there was such a thing as preserved greens vs. the fake kind – very good to know! I think I'm going to bookmark this for some ideas in the future. I've managed to kill a few indoor plants recently, so I could use a few tips. 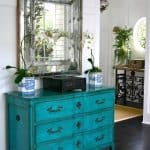 Those are gorgeous!Plants can make such a big difference, and these are great tips for those of us who sometimes forget to water our plants! Thanks! Dahhhling.. enjoyed your post very much. I have a well documented obsession with preserved boxwood. I could not agree more, if you can't afford the preserved box wood or have a horrid green finger like I do, then just opt for other alternatives versus plastic! I'm all about saying no to faux! Agreed that succulents and orchids are great versions of real plants that last a long time. Real plants just add an extra special touch to a space. Right now, I planted amaryllis and paper white bulbs for the holidays. This is also a great way to include real plants indoors. I'm with you – never fake…always real. I went into Coach store a couple of weeks ago and they had an artificial fig leaf tree about 8 feet tall, that if the sellers had gone to the back to get something I would've run out of it dragging it along with me. It was incredibly real looking and they are not sheap. I laughed at your comment about the dusty fake fig. I have them all over the house. They DO get dusty so I bring them out in the summer and hose them down. I kill everything so the faux fig works best for me – I put lights on them (w timers). Perfect night lights. 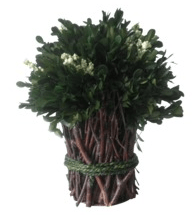 Thanks for the tip on the preserved boxwood sale. I usually have orchids all over the house, but these might help when I forget to water. I can't do plastic, but I do end up with yellow leaves when I forget to water. Thanks for sharing such a useful information. I will also use artificial plants in my home from today onwards.